no,not this time. | escaped. Can't wait! Though purse makin nipis. Hmph. I don't like travelling alone, that's why I don't do densha much. Norikae much. Not in this lifetime. Tried Situasi last few days since he mentioned it. Tak boleh blah haha. But I think it was okay considering the suntuk time. Updated self since away the last few days. Not much, though. Rihanna is getting back together with Chris Brown. Britney is still lipsynch-ing in her recent concert. Nothing new. 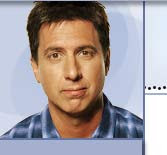 Meet Ray Romano, my favorite guy at the moment.